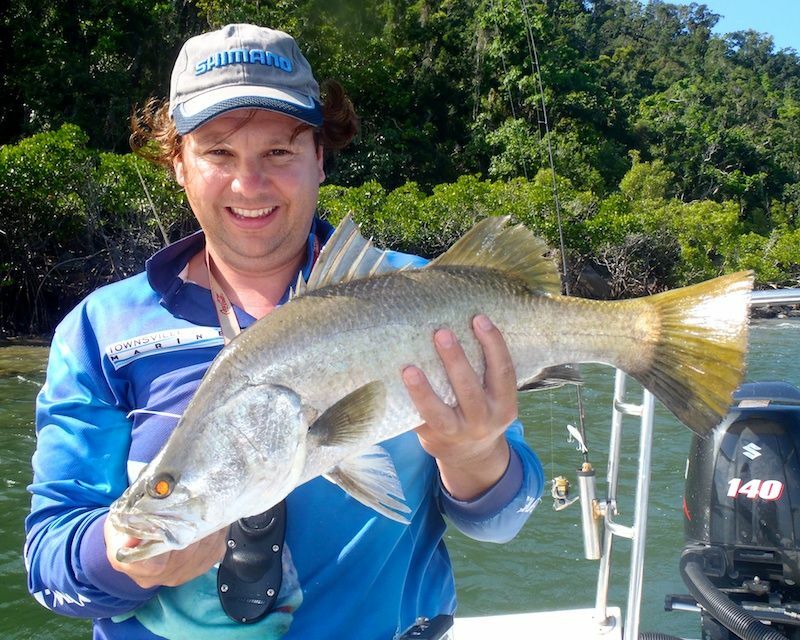 G and T Fishing School owner Graham Knight and I have been itching to get back up to Hinchinbrook for a fish together for a very long time. Last Sunday presented us with the oportunity to head up and chase some of the big silver salties that Knighty has been nailing of late. Our plan early in the week was to head up to Missionary Bay for the day. Light winds were forecast and I have never had the chance to venture that way. But the forecast later in the week started to predict strong NE winds in the afternoon, not ideal for a run home from Missionary! So a last minute change of plans saw us put Graham's 5.8m 'Cruse Control' in at Lucinda to fish the southern end of the channel. We left Townsville very early to ensure we were at the ramp by first light. With light winds for the morning Graham took us out to the end of the Sugar Loader to chase some fingermark. Some good fish were showing on the sounder and soon we were letting down our G.I.M.P. lures. The fish were there, but they were hard to entice a bite from. But soon Knighty was getting a few decent bumps. A couple of missed hookups and then he was on. A short solid fight soon had a nice keeper size Finger in the net. I was next to get a hit, and the 20lb PowerPro sizzled off the Sustain 4000fe. The angle on the line started coming up and I was praying for Barra. But a big Queenfish soon launched into the air. After a few more speedy runs and lunges just under the boat, the fish was led into the net. At 107cm it was a lovely fish! It was a long time before the next decent hit, but it was Knighty who managed to sink the hooks. He was soon tussling with a very solid fish on 30lb. Several strong runs along the bottom and we were pretty sure it was a good finger. A few minutes later and the fish came into sight, easily a 6-7kg Fingermark. But on the next run the hooks pulled! A few expletives were said, but ultimately there was nothing we had done wrong and nothing we could do about. But it was to be a point of discussion for the rest of the day! It started to get a little lumpy for the 'flats' boat, so we headed back into the channel for the target species. We started working some rocky outcrops, but despite a couple of Barra crashing bait, we only managed a few cod. The tide had quickly dropped too low for this area, we were about an hour too late after chasing the Fingers. We then headed up Benji flats and worked around some drains and snags, but only managed a handull of Salmon and Grunter. The tide was now on the incoming and not ideal for what we were targeting. As the tide built in the afternoon we made our way back to the rocky headlands for one last go at a big salty Barra. And it didn't disappoint. I picked up a few smaller fish on the DOA prawns and my Stella 1000fe, including one legal that, at 58.5cm, went back to grow a little larger. But then something bigger came along! I got to see the fish strike and take the DOA in crystal clear water not too far from the boat. I know it was a decent fish, and soon the 8lb PowerPro was pealing off the Stella. A bit of tight manoeuvring of the rod and some extra pressure on the spool managed to keep the fish from reaching the snags, and it was soon into the open water where I could play it out better. The fish surfaced 3 or 4 times and lunged back to the bottom every time. I was very nervous knowing my leader was only 20lb! But I am yet to have a fish wear through it. The fish quickly tired and was lead into the net. Some handshakes and high-5's before the obligatory photographs. At 76cm it is my best Barra for a long time, and maybe a PB for the Stella. As this fish had hit my lure away from the rocks and more in the deeper open water, I decided to next send down a Thready Buster. This was attached to a Sustain 1000fe that was being used earlier in the day. And yes, still 8lb PowerPro and 20lb leader. It only took a couple of casts and the Thready was hit hard. Line tore off the Sustain spool and the fish headed up the creek. Then I lost weight on the fish. Hooks pulled and fish kept going! From the power of this run I strongly believe this was even better than the 76cm, but its hard to say for sure. Knighty then proceeded to miss 3 really good strikes, all in quick succession and all from fish in the 70+ range. We saw the fish hit the lure every time, but they just failed to find the hook. The tide then came up too high and the fish disappeared into the back of the mangroves. Time for home! Knighty is a real character to go fishing with. He knows Barra like nobody else I have fished with. So if you are looking for a day on the water that you will never forget, give him a call an book a session. Barra season is closing soon and I know he is booking out fast! So get in quick and secure a position. 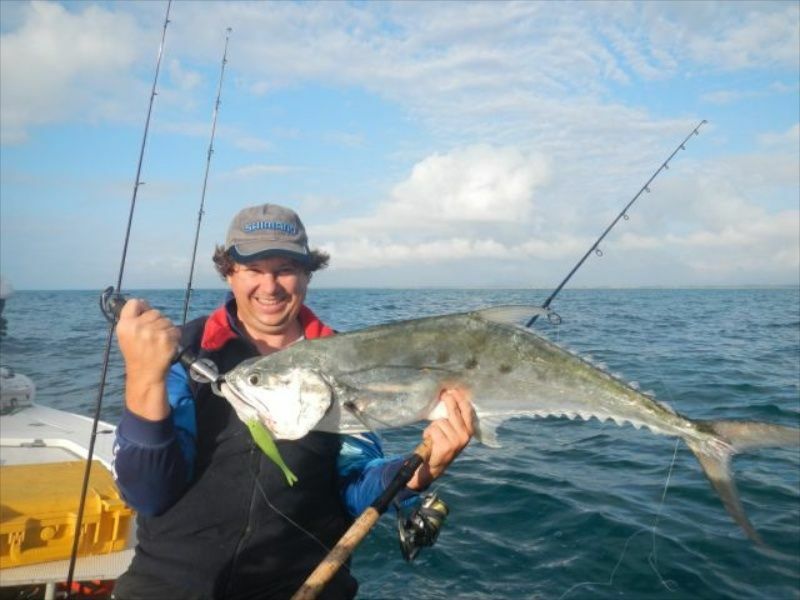 Visit www.gtfishingschool.com.au for all the details. 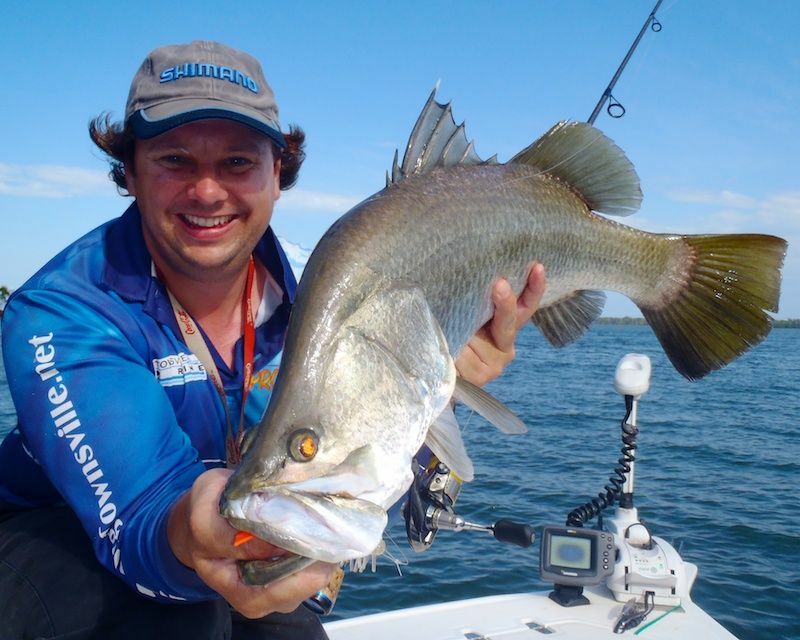 Barramundi in the cold snap!